We’re at the part of the story, being told in flashback, where Elizabeth Short has been identified, her mother has learned about the murder from the Examiner, and now there’s bruising competition among the newspapers to find out everything about the murder victim. I’m guessing the yarn of Bevo Means and the Black Dahlia nickname should be next or at least soon. Wolfe is getting into Will Fowler’s biography. I’ll take a rain check on the old foxy grandpa. Like his cartoon counterpart, Will loved nothing better than to pull one over on his gullible nephews. 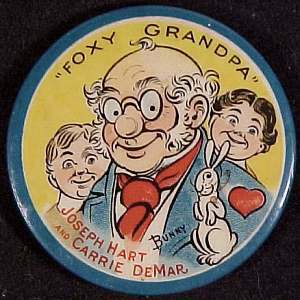 “Tell us about the Black Dahlia case, will you, Foxy Grandpa?” “Oh sure, kids, come on in and I’ll give you the whole story about me and the Black Dahlia.” And then he’d chuckle. Hm. Next a history of Manchester Boddy’s Daily News, originally known as the Illustrated Daily News. Oh man, Wolfe is wading into the history of newspapers in Los Angeles. This is why the “Laura” structure (anonymous, butchered body is found and her life is told in flashbacks) is terrible for telling history. The murder story comes to a complete halt for three pages of non-thrilling background on the nuts and bolts of Los Angeles journalism. I know if I slowed down and read this section I would find mistakes because this book is a bonanza of errors. But in the interest of time I’ll only point out the worst clinkers and come back later if it’s pertinent. As anybody with access to the paper knows, the Los Angeles Times never put the Black Dahlia case on Page 1 except for the day when it looked as if Cpl. Joseph Dumais was the killer. The rest of the stories appeared on the first inside page or somewhere near the front because The Times considered itself a family paper. There’s no excuse for getting this wrong. The Times, while certainly behind the Examiner in covering the Black Dahlia case, scored its share of scoops and covered the case to the best of its ability. The idea of “Donahoe’s handouts” is particularly amusing. The LAPD in the 1940s had no public information officer issuing press releases. Reporters talked directly to the police officers involved in an investigation. This only changed in the 1950s. What’s the source for this nonsense? Will? Oh, we’re going to hang this on David Halberstam’s “The Powers That Be,” yet another in our five-foot shelf of secondary sources. To the bookshelf, Watson. Halberstam, Pages 94-122. I hope this doesn’t turn out to be about JonBenet Ramsey, like Wolfe’s citation of “The Cases That Haunt Us.” Nope it’s the whole chapter about the Los Angeles Times. Don’t recall Halberstam writing about the Black Dahlia case, though. (Man, Halberstam’s portrait of Times political editor Kyle Palmer is devastating. Absolutely damning). Nope, not a word on the Black Dahlia case. Nothing about The Times being forced to put the Dahlia on Page 1 to compete with Hearst. This is just Wolfe throwing in nonsense for no apparent purpose. But don’t take my word for it. As readers of the 1947project know (Happy Foot to crime buddies Kim Cooper and Nathan Marsak. You rock!) the Los Angeles Times is available online through Proquest from the 1880s to 1985. This service is available free through the Los Angeles Public Library (you need a library card to sign on). Well worth it. There’s a reason historians love libraries! Branson, Mo. (4.244.183.184) home of the Boxcar Willie Center for the Performing Arts.